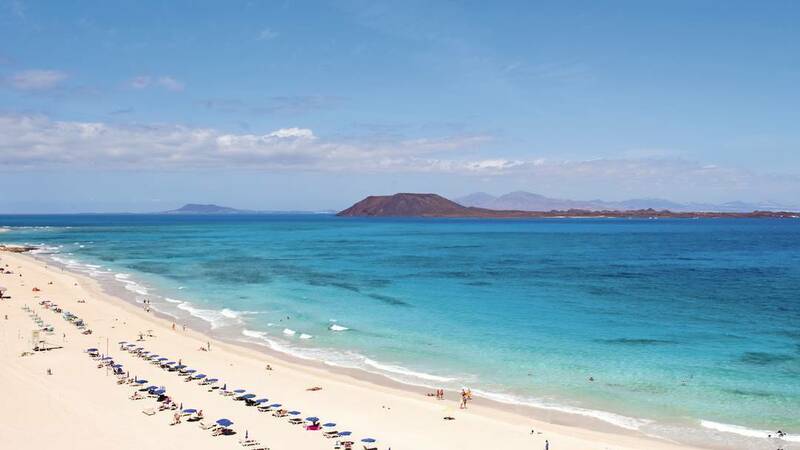 Fuerteventura is one of Spain’s Canary Islands which sits in the Atlantic Ocean off the coast of Morocco. It’s known primarily as a holiday destination due to its white-sand beaches and year-round warmth cooled by constant winds. The multitude of beaches that wrap around it are interrupted by cliffs and sheltered coves. It’s popular for water sports, especially surfing, windsurfing and waterskiing. There is over 150 km of beaches for you to enjoy the sunshine and sea breeze. There are long sunny days, intense wind, and huge waves which means that the island is very popular for windsurfing and kite surfing. 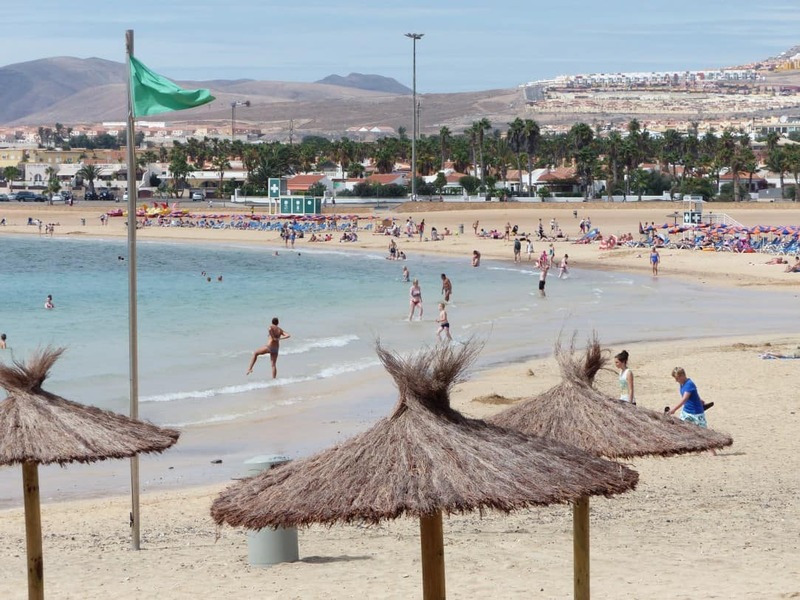 There are 4 popular vacation areas in Fuerteventura, Corralejo, Caleta de Fuste, Costa Calma and Morro Jable. 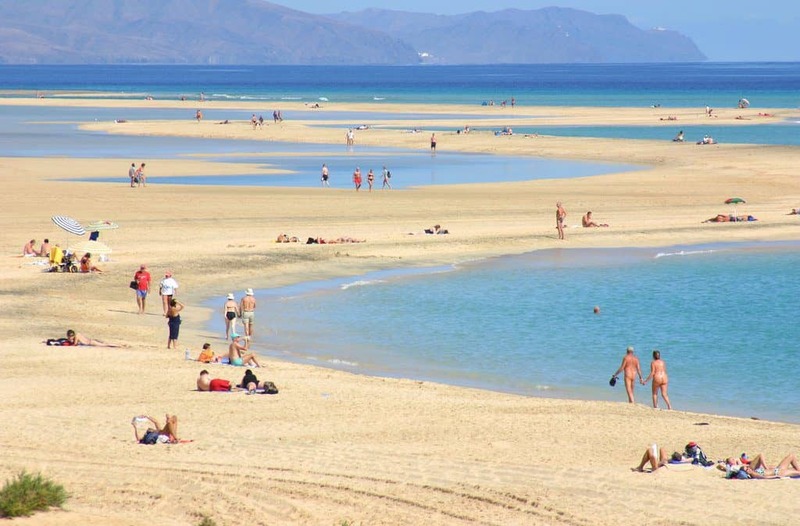 Here is our Fuerteventura Beaches Guide with the top beaches. Despite the number of tourists, the former fishing village near the harbor and main beach still has charm, with narrow, uneven streets, good seafood restaurants and even a fisherman’s cottage or two. Venture inland a couple of blocks and you find the predictable could-be-anywhere resort with Slow Boat buffets, fish and chips and a grid system of streets. The buildings are low-rise and you can still find a few local Spanish bars. What makes are the miles of sand dunes to the south of town, sweeping back into gentle sugar-loaf rolls from the sea and fabulous broad sandy beaches. Protected as a nature park, no one can build on or near them. 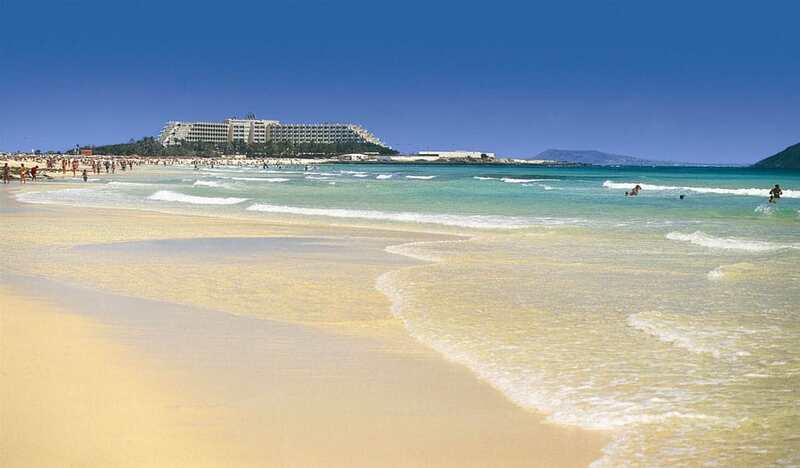 Visit our Corralejo Vacation Guide to plan your Corralejo Beach vacation. This nature park stretches along the east coast for about 10km from Corralejo. It can get breezy here, hence its popularity with windsurfers and kiteboarders. The locals have applied their ingenuity to the sand-sticking-to-the-sunscreen problem by erecting little fortresses of loose stones atop shrub-covered sandy knolls to protect sun-worshippers from the wind. The area is also known as Grandes Playas and is free to enter; sun loungers and umbrellas are available for hire in front of the two (eyesore) luxury hotels. 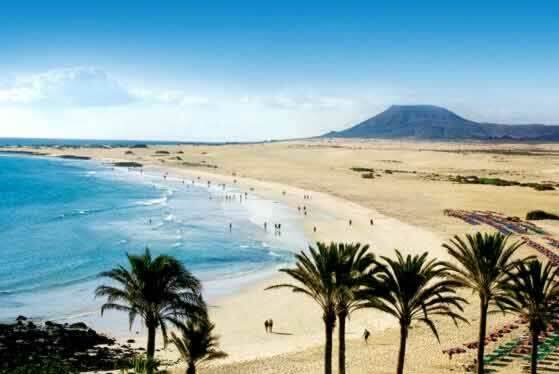 Visit our Corralejo Vacation Guide to plan your Corralejo Beach vacation. El Caserón beach is a popular blue flag beach that is very large. The beach is 300 meters long and 45 meters wide, its setting is rustic.This is a good ideal beach for children and families. There are facilities for elderly tourists and tourists with disabilities . The beach has two parking lots, a disabled access ramp, showers and restrooms, hammock areas, a bar-restaurant and many other amenities. 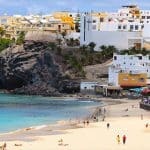 Visit our Corralejo Vacation Guide for everything you need for your trip, hotels, restaurants, things to do and much, much more! 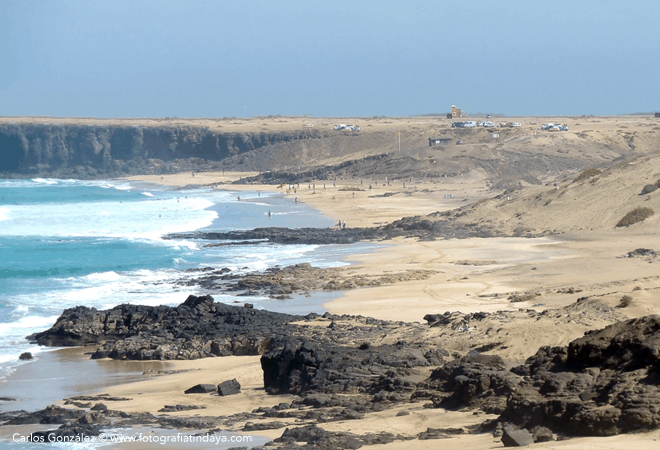 The white sandy beaches stretch for miles to the south of El Cotillo. They are on the west coast of the island and therefore the waves tend to be larger than average. The size of the beaches means that even on a busy day it is possible to have lots of space to yourself. 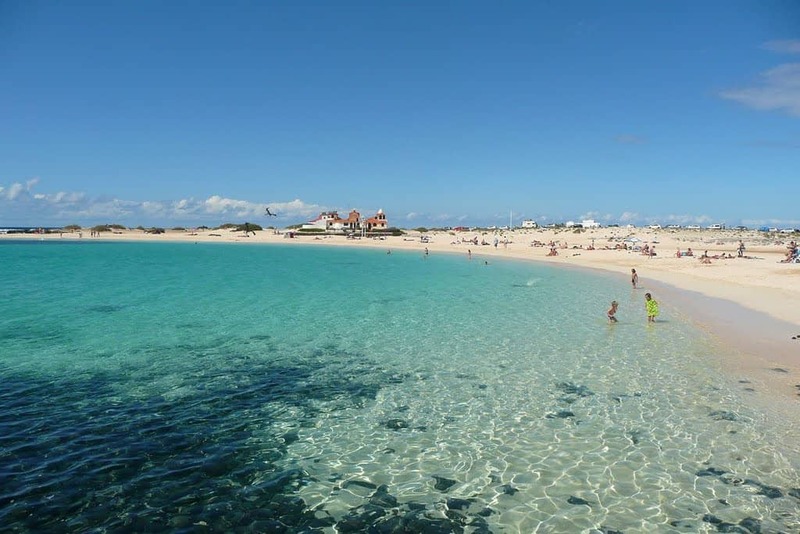 A popular spot for visitors to El Cotillo are the lagoons which are on the road north of the village towards the lighthouse, and along the shoreline to the east of the lighthouse. White sand and clear blue shallow water are an attractive feature alongside the volcanic rock. Visit our Corralejo Vacation Guide for everything you need for your trip, hotels, restaurants, things to do and much, much more! 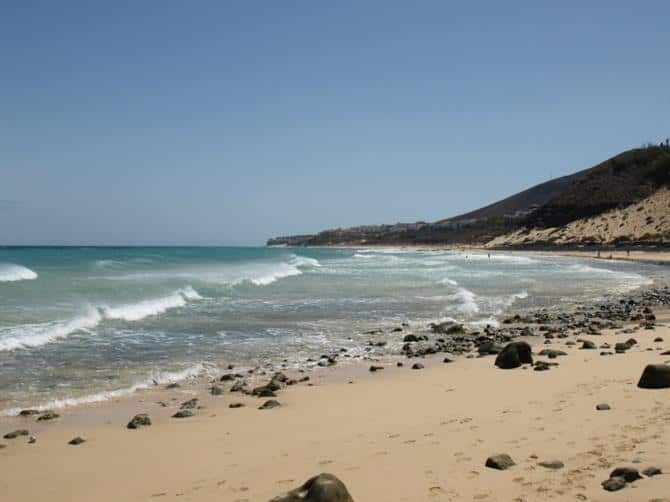 La Concha is one of Fuerteventura’s best-known beaches for its beauty, quality and tranquillity. The beach’s close proximity to the town allows you enjoy a break with incredible sea views and amazing sunsets, where the sky changes from ochre to violet in a matter of minutes. 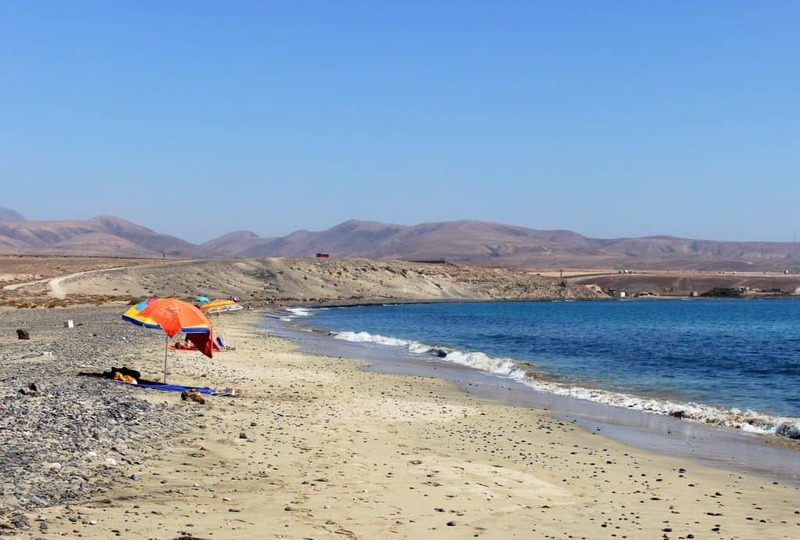 La Concha beach enjoys gentle waves thanks to its natural horseshoe-shaped reef. When the wind picks up the ‘corralitos’, small circular walls made from volcanic rock built by residents, are the perfect refuge, and at low tide the children can play safely in the small rock pools that form. There is parking very close to the beach and a lifeguard service as well as a restaurant nearby. 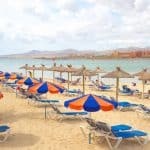 Visit our Corralejo Vacation Guide for everything you need for your trip, hotels, restaurants, things to do and much, much more! Corralejo is the largest resort on Fuerteventura. This town beach, with its calm waters, is best for families. Head to a different beach if you want wind or kite surfing. Your opinion of this place will depend wholly upon where you are standing. Despite the number of tourists, the former fishing village near the harbour and main beach still has charm, with narrow, uneven streets, good seafood restaurants and even a fisherman’s cottage or two. 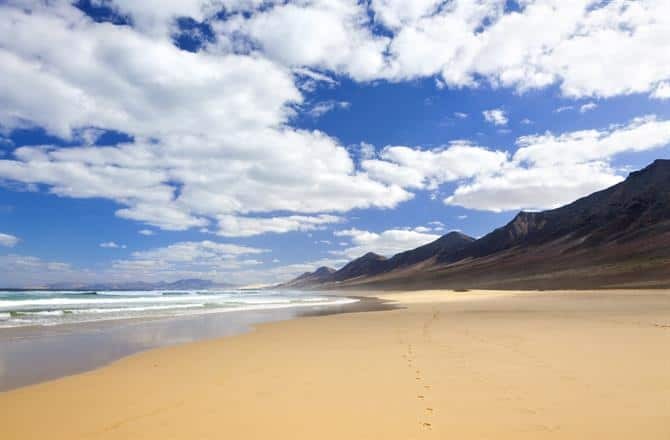 What makes Corralejo, however, are the miles of sand dunes to the south of town, sweeping back into gentle sugar-loaf rolls from the sea and fabulous broad sandy beaches. Protected as a nature park, no one can build on or near them. Visit our Corralejo Vacation Guide for everything you need for your trip, hotels, restaurants, things to do and much, much more! 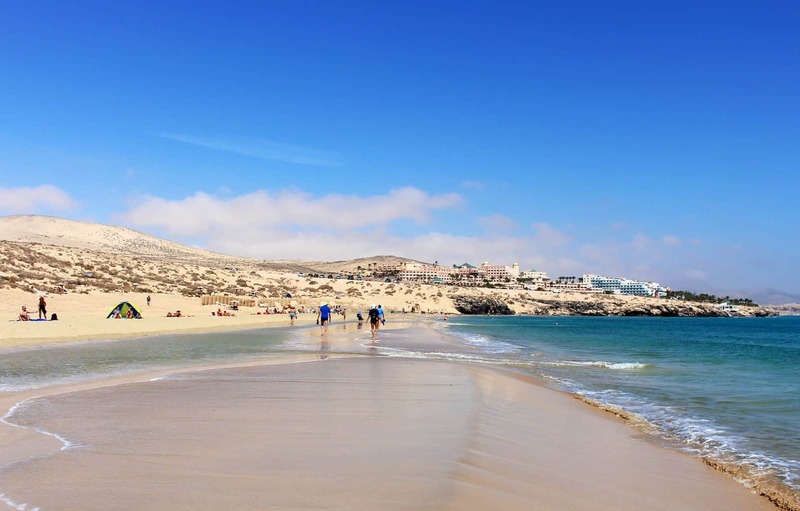 The beach of El Aljibe de la Cueva is in a virgin place which is located at the north of the capital of Fuerteventura, in the vicinity of El Cotillo. It has a length of 1,210 meters by 30 wide which make it one of the most larger beaches in the area. It has fine golden sand and small lava formations. Is a windy beach with strong waves and rests at the base of a cliff. Its waters are rich in fish and colonies of mussels. This is a hidden beach where you will find nudist sunbathing and playing in the water. 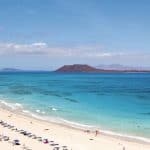 Visit our Corralejo Vacation Guide for everything you need for your trip, hotels, restaurants, things to do and much, much more! Calete de Fuste is the largest community in the municipality of Antigua, Las Palmas. The area is frequented by a variety of tourists and has numerous hotels, shops, boutiques, bars, cafes, and restaurants on or near the beaches. In addition to beach activities, local recreation includes sailing, diving, windsurfing, and scuba exploration. The ocean waters in the area are known for their dolphin and turtle populations. Sotavento has huge dunes of pale golden sand that are usually deserted. This beach stretches down the south-east coast of the island, part of the 17 miles of continuous beach between Playa Barca and Morro Jable on the southern tip. It is a popular beach for naturists. The sea has a temperature of around 70F all year round and is perfect for just floating around. Conditions are excellent for kiteboarding and windsurfing – the world championships are held at the Playa Barca end of the beach every summer. There are beach bars in the busier sections, but take your own supplies if you’re not feeling that sociable. The beach is to reach by car or bus from the resorts along the east coast, with parking by the beach. Hotel H10 Tindaya is right on Sotavento Beach. Visit our Calete de Fuste Vacation Guide for hotel information, as well as everything you need to plan your trip to Calete de Fuste. This horse shoe shaped beach of Caleta de Fuste is an ideal location for families with its easygoing, relaxed atmosphere and gently shelving beach. The sand at this beach is imported, and It is possible to feel the difference. The artificial sand does actually feel a little harder than sand on natural beaches. It is 800 meters long with sand the shade of vanilla ice-cream. Watch out for the tide as it does come in quickly and you can find yourself knee deep in water when you wake up from your siesta! There are plenty of activities here including diving, sailing, boating, and submarine trips. Stay at the Caleta de Fuste Beach at the all-inclusive Barceló Castillo Beach Resort. Visit our Calete de Fuste Vacation Guide for hotel information, as well as everything you need to plan your trip to Calete de Fuste. Gran Tarajal is a great place to fish, and you could see your lunch being caught on Gran Tarajal. It is a Blue-Flag beach on the east of the island with sand darker than on other beaches. It is an expansive beach that consists of a fine black sand. The swimming is safe, and showers are provided at points along the promenade which adjoins the beach. We recommend you use these as the black sand seems to stick more readily than the other varieties of sand. Gran Tarajal has a large range of shops, but being a mainly Spanish town these tend to be closed in the early afternoon, for the siesta. So go to the shops early! Stay at this beachfront resort at the R2 Bahía Playa Design Hotel & Spa Wellness – Adults Only. Visit our Calete de Fuste Vacation Guide for hotel information, as well as everything you need to plan your trip to Calete de Fuste. As you continue south along the coast from Matas Blancas, the beaches get longer, the sand gets whiter, and the water gets bluer. Costa Calma, about 25km northeast of Morro Jable, is a confusing muddle of one-way streets interspersed with apartments, shopping centers (at least eight!) and the occasional hotel. The long and sandy beach is magnificent, but the whole place lacks soul or anything historic; its lifeline being the (mostly) German tourists. If you like peace and quiet and you enjoy nature and relaxed swimming, then you are in the right place here. The approximately 500-meter long beach offers plenty space to spread out and caravan owners can find a good spot with a view of the sea here. Kite-surfers who bring their own equipment can also take advantage of the good surfing conditions. Swimming is very enjoyable on this partly sandy and partly pebble beach, as there are hardly any waves and currents, and swimming naked is also possible. Visit our Costa Calma Vacation Guide for hotel information, as well as everything you need to plan your trip to Costa Calma. Playa de la Barca looks completely different at full moon and at new moon. The large sandy area is transformed into a big lagoon. This dramatic change of scenery makes the beach very special. Furthermore, it is very popular with wind surfers and kite boarders because of the unique wind conditions. The local René Egli Windsurfing Centre hosts the Windsurfing and Kite Boarding World Cup every year. Visit our Costa Calma Vacation Guide for hotel information, as well as everything you need to plan your trip to Costa Calma. 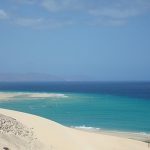 Risco del Paso is a real highlight for all Fuerteventura visitors. The beach has a lot to offer: relaxed swimming, windsurfing, kite surfing, long walks along the beach, beautiful nature – something for everyone. The change of scenery with the tides is spectacular: a seemingly never-ending sandy area at low tide and a lagoon salt-water lake with an enormous sandbank like a hill in the middle at high tide. 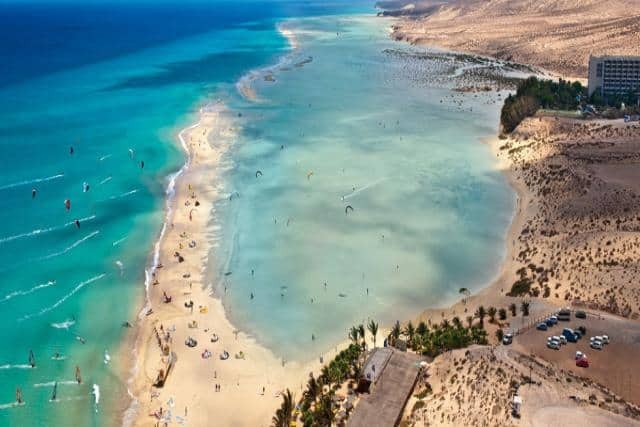 Ideal for swimming, Risco del Paso is definitely one of the most beautiful beaches in Fuerteventura and would score well in any international comparison. Visit our Costa Calma Vacation Guide for hotel information, as well as everything you need to plan your trip to Costa Calma. Close to the town of La Lajita, you’ll find Playa de Costa Calma – Costa Calma beach. It is two kilometers of white sand and refreshing turquoise waters. Its idyllic shoreline invites you to stroll along the sand, admiring the impressive views of a coastline full of ochre mountains, smoothed by years of erosion. 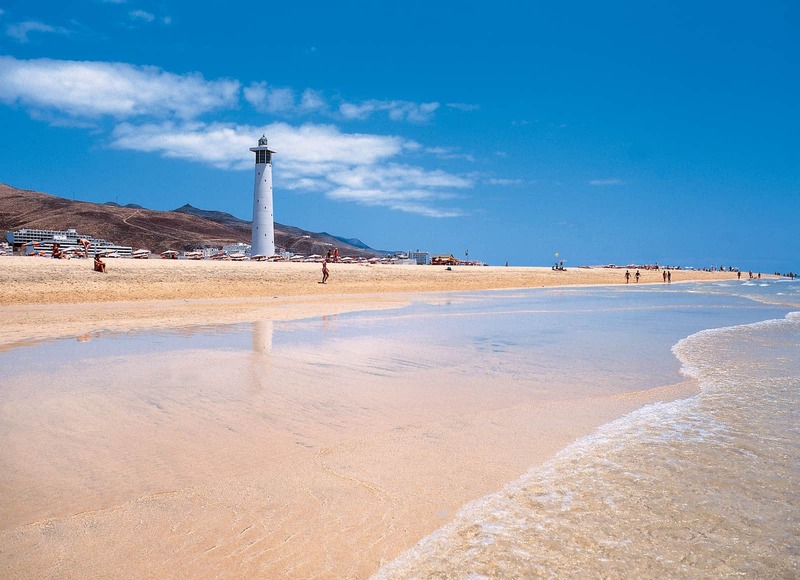 Costa Calma beach is just one of a number of stretches that are linked during low tide. In the northern section there are two small family beaches. When the wind picks up, the southern section is perfect for surfing and windsurfing lessons. The range of accommodation available near the beach ensures an excellent range of services such as sunbeds and parasols for hire, lifeguard cover, and lots of water-based activities. The access road is flanked by local vegetation making Costa Calma an authentic oasis in the white sand. Visit our Costa Calma Vacation Guide for hotel information, as well as everything you need to plan your trip to Costa Calma. 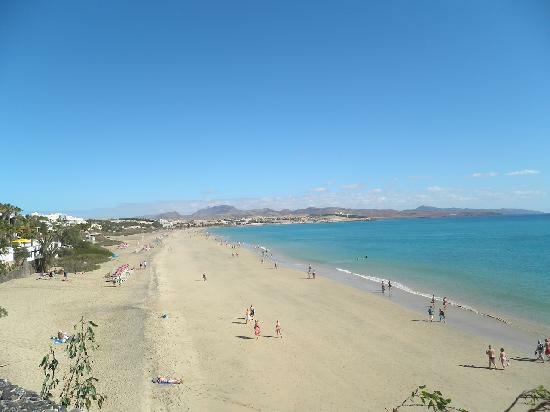 Esmeralda is a small beach and one of the most popular of Fuerteventura. It is also popular with windsurfers. It is a relatively wind-protected beach, with turquoise water and white sand. It is a small size beach and less crowded than some of the other beaches. To get to this beach go to Hotel H10 Playa Esmeralda or get to it from Sol Gorriones in Playa Barca. There is plenty of parking at the beach. You will also find beach lounge chairs, and a snack bar nearby. If it is high tide, you will not be able to walk to the snack bar. You will have to take your car. If you want to spend your day on a wild but beautiful beach, this is your beach. Visit our Costa Calma Vacation Guide for hotel information, as well as everything you need to plan your trip to Costa Calma. Morro Jable is almost exclusively German. The beach is the main attraction, with pale golden sand stretching for around 4km from the older part of town. It’s fronted by low-rise, immaculately landscaped apartments and hotels. Back from the beach, the charm palls somewhat with a dual carriageway lined with commercial centers and hotels. The older town center, up the hill, provides a glimpse of what the town must have looked like before the charter flights started landing. 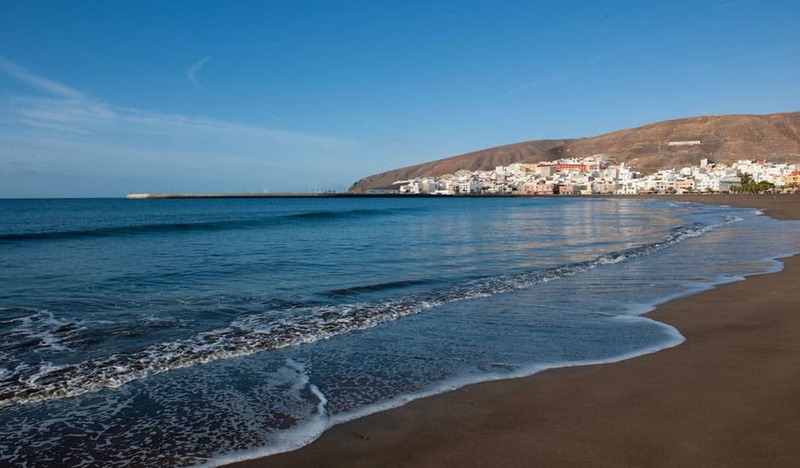 The Morro Jable beach extends for four kilometres and is bordered by an enormous avenue with shops, leisure areas and restaurants, and the Jandía salt marsh, an ‘Area of Scientific Interest’ for the conservation of a scarce plant in the Canary Islands that is resistant to salt water. A tourist beach with lifeguards, sunbeds and parasols for hire, small beach bars and several areas for water sports such as surfing or canoeing. The best way to enjoy this beach? Stay in a hotel nearby to spend a blissful day out at the beach, and then finish off with a quiet dinner beside the sea as the sun sets. For everything you need to plan your Morro Jable vacation, Visit our Morro Jable Vacation Guide. The beach has the usual water sports activities going on and it is possible to go sailing in a hired boat. The beach at Jandia is informally divided into a naturist section to the left of the lighthouse when looking out to sea, and a clothed, but not many, to the right. There are sunbeds available on both sections and the sea is pleasant for swimming. Naturists tend to frequent the area to the left of the Lighthouse as you are looking towards the sea. For everything you need to plan your Morro Jable vacation, Visit our Morro Jable Vacation Guide. Esquinzo beach consists partly of light-coloured sand, partly of stones. Esquinzo is a tourist town which was constructed near the light sandy beach only a few years ago. Though the beach is not very large, you can walk from one bay to the next. In some parts, the beach is bordered by dark rocks. To get there get on Motorway FV-2, take the exit 79. On the next roundabout take the exit El Salmo and then turn left towards Esquinzo at the next junction. In town you go off the road and drive left. Here you can park your car and walk the last few meters. For everything you need to plan your Morro Jable vacation, Visit our Morro Jable Vacation Guide. Cofete beach is not suitable for bathing. There’s something mysterious in it. Deserted, solitary, lonely, and in the background you can see the mountains of Jandia where the clouds get caught. The weather is always breezy and the waves are very high. The beach appears breathtakingly beautiful! You shouldn’t bathe here because of the high waves and the strong current. On the approx. 2-3 km long beach there are no tourists or locals. The beach is also absolutely unsuitable for children. If you visit Fuerteventura, you should take a day’s time for exploring this piece of pristine nature. Enjoy the silence in Fuerteventura’s deep south. For everything you need to plan your Morro Jable vacation, Visit our Morro Jable Vacation Guide. I have to say, Leahrae, that you make all these lovely beaches sound most appealing. And the pictures you have added give a real idea of what the beaches look like. It feels like I am there! There is a stretch of beach for any need on the Island, whether it’s a family with children, or couples. I see that it is close to shopping and golf courses. I am glad I found this information, as I was looking for a unique place for a vacation. I love it! Yes, and you would really enjoy any Fuerteventura beach. The island is very diverse and there is something for everyone for sure! Thanks for visiting! Nice! Lovely beaches and great explanations! Definitely adding to my places to travel. I love places that are very cultural and not touristy. Which would you recommend for great local food, people and least amount of tourists? Costa Calma is probably the least touristy and you will find great food and cultural experiences. Thanks for reading and yes, Fuerteventura is a very unique beach location. Wow, I love your website!!! Great post! So many beautiful beaches! I really like your beach guide and descriptions. It’s amazing how many beautiful and different beaches are around the word. I live in Sydney were I have many of them too, each one different and beautiful in own way. 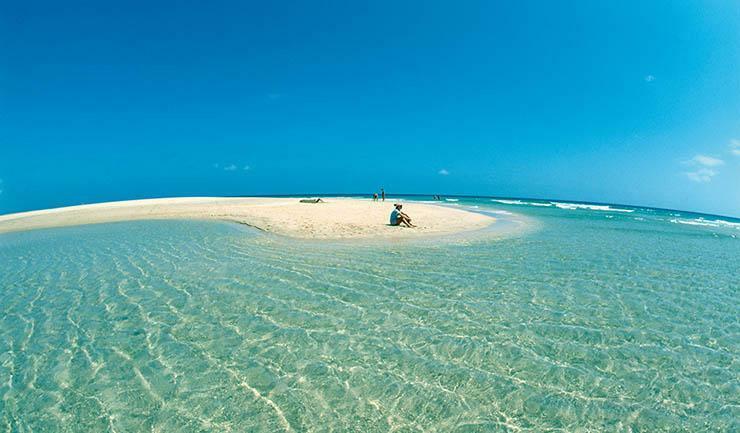 I’ve never been to Canary Islands but the beaches there look gorgeous! Thanks for the detailed guide. Bookmarked! Hi LeahCrae, You have a great assortment of beaches. I grew up on lake Michigan and some of the finest beach sand and spectacular dunes on west Mi. lake shore. I now live in Ky. that has many rivers and man made lakes but not like the ocean or great lakes beaches. My daughter lives in the Houston area and I have enjoyed Galveston. I have the beach in my blood too. We recently took a trip to Myrtle Beach and my compass was messed up because I am usually on the west coast. Great website and very enjoyable. 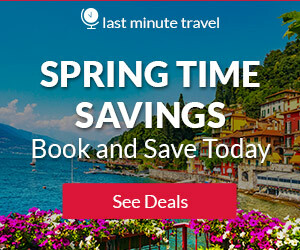 The next time we plan a trip we will have to check your site. There is a lot of information about the various beaches and it’s great that you were told which ones were family/kid friendly and which weren’t. I think if I was going El CaserÃ³n sounds like a pretty chill place. Yeah there would be tourists, kids, and elderly, but that just means some great people watching while I’m sipping a tropical drink swinging in my hammock and writing about my adventures and the people I’ve met there. And who knew there was a beach anywhere that wasn’t a real beach because it’s artificial sand? Apparently at Caleta de Fuste the sand has been imported and you can feel the difference between its sand and normal beach sand. That is something I’d want to check out just to say that I saw it for myself. This is right up my alley. All of my children were water babies and now my grandchildren and great-grands are too. We are always looking for a different beach to vacation at during the summer when all the kids are out of school. I remember when I bought my house, it was the in ground pool that tipped my decision! I’ll be back to see what new spots you have added because summer will be here soon and I’m looking for a new destination this year. Absolutely beautiful! I would love to go and stay at one of this amazing places. Do you have a favorite location? The video was excellent and really gave me an insight. Love the video! Is there a time of year that’s best to schedule a stay? Yes, I like Tenerife the best. The beaches are just amazing! Best time would be March to May or September to November only because there are less tourists there. I went in October and it was amazing! Really amazing place! I’ve been looking for a place to take my family and explore a little and this looks like a place a must see. I really love the beaches there. Thank you for the great information, especially putting info on hotels and the video. Now I need to find out when I can go there because I just added another place to visit on my bucket list. Thank you again for the information. Those beaches you suggested look stunning & with plenty to do! Going on my to do list. Greatly written! Haha I know where I am going now on my next holiday!I live in Europe and sometimes I forget the beauty of Europe because we all want something different it seems. You bring back the fact that there Astonishing beauty is always near in Europe :D.
Yes, and my German aunt now lives in the Canary Islands and all my German relatives can’t wait till their next visit with her LOL. 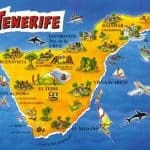 The Canary Islands are awesome! I am ready to start packing! I had no idea of the diversity within the Canary Islands. They are now added to my bucket list for travel destinations. Fiji may be replaced!! Thank you for giving such a picturesque and thorough presentation of what may be my next “save my $$$ for” getaway! I will definitely be following your posts! These destinations are definitely on my bucket list. When would it be great to visit these places? And as a first timer, which beach would you highly recommend? I would probably recommend Sotavento, as it is centrally located near a lot of other beaches and there are lots to do nearby. The Canary Islands are warm year round. The coldest months are going to be January and February with temperatures topping off at 70. I went in November and was sunbathing on the beach and it was beautiful! Wow, all these beaches look and sound amazing, especially the beach in the first picture, I would have never known it was in the Canary Islands, looks like more like something in the Pacific near Fiji. My husband is English and we are always traveling between the US and the UK, stopping off here as a little getaway would be amazing. I had no idea that there were such tropical beaches so close to Europe, great find! Lots of great info here! I like reading about new places that are not yet on everyone’s vacation radar. It looks absolutely divine!